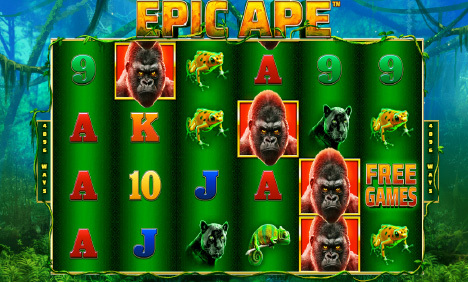 Fly Casino now has Epic Ape! This huge 6-reel, 4,096 ways to win slot game is the latest slot game sure to bring you big thrills and chills. This game is highly volatile offering those that have the patience to hit it big. Just as Buffalo Blitz slot at Fly Casino, Epic Ape is all about the Free Games feature which is triggered when you get 3 or more Free Games scatter symbols anywhere on the reels – 3 will give you 10 free spins, 4 will give you 25 free spins whilst 5 will give you 50 free spins. If you’re lucky enough to get 6 on the reels, you will get a massive 100 free spins! Epic Double Bonus! On Sunday from 00:00GMT until 23:59 GMT, all members on their first deposit of just $/£/€30 or more will receive a 75% bonus up to 75.00. Claim 2X! $30 Gets $40 X 3 Play Day! From 00:00GMT until 23:59 GMT, all members on their deposit of $/£/€30 or more will receive a $/£/€40.00 bonus. Claim it 3X. $200.00 BIG TUESDAY! From 00:00GMT until 23:59 GMT, all members on their deposit of $/£/€50 or more will receive a 100% bonus up to $200.00 bonus.